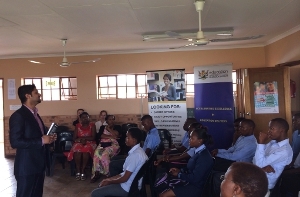 The National Youth Development Agency (NYDA) launched its annual Start Here Campaign, a comprehensive Career Guidance programme, at Senzangakhona Secondary School in KwaMhlanga, KwaNdebele Mpumalanga on the 7th of February 2014. The programme is aimed at enabling young people to access reliable and up-to-date information upon which to make informed decisions about their lives and their futures. The initiative forms part of the NYDA’s broader Back to School programme and is but one service amongst the agency’s new focus on Education and Skills Development as a vehicle towards reducing unemployment amongst South Africa’s youth. Phase one (10-14 February 2014): rural school visits nationally where NYDA Career Guidance councillors provide free group Career Guidance session to grade 9 learners. Phase two (17-28 February 2014): One-on-One Career Guidance sessions offered free at all 14 NYDA branches nationally with a focus on out of school youth. This year the initiative was launched with a presentation of an exciting new NYDA Career Guidance booklet which will be distributed to schools nationally. The new improved booklet is an updated version of the NYDA’s comprehensive Career Guidance instruction tool used by practitioners in schools nationwide. It provides information geared towards three target groups namely, Grade 9 learners focusing on subject choices, Grade 10, 11 and 12 learners with an emphasis on further education opportunities and on out-of-school youth presenting topics like job seeking and entrepreneurship as well as a simple self-assessment which can be used by all three groups. The NYDA has committed R3.1 million to career guidance programmes annually while additional funding has been secured through a partnership with MerSETA. Thus far 533 186 young people have received group career guidance support from the NYDA and the target is to ensure that atleast 700 000 youth access career guidance support by the financial year end of March 2014. According to the NYDA Executive Chairperson, Yershen Pillay, “We cannot adequately stress the importance of comprehensive career guidance in shaping a young person’s career. Without adequate information and direction, young people often make the wrong subject or qualification choices which lead to inevitable failures later on in life. Caption: NYDA Executive Chairperson, Yershen Pillay launched the 2014 Start Here Campaign at Senzangakhona Secondary School in KwaMhlanga, KwaNdebele Mpumalanga.